Like many job specifications found in an organisation, the role of the payroll department has changed significantly over the last 10 years, both quickly as well as by differentiation. Since the invention of computers and the subsequent addition and growth of computers to the common workplace, jobs have in many instances, had to be almost reinvented. Since computers were inventd, they themselves have undergone a massive transformation in look, style, design and mostly importantly function, application and speed, leaving certain job functions completely changed or simply no longer required. The function of the payroll department has changed fairly drastically over the last 10 years or so. About a decade ago, the HR and Payroll departments were rolled into one and the person responsible was in charge of everything concerning the personnel in the company. This included everything from salaries and wages to leave, recruitment and terminations. The role of the human resources person and that of the payroll person has during this time, diversified and companies started to realise that the traditional roles were actually quite different and that the type of person drawn to a human resources role compared to the type of person who was drawn to a payroll function, were intrinsically very different from each other. Take a person who is naturally empathetic, good with people as well as administration and place them into a role where they are captured numbers and understanding financial concepts, you might well find that the outcome is not a particularly good one. Which is how it came to past that the “personnel” role was split into two and while they 2 functions deal with the same entities, the people within the organisation, what they do and how they do it could not be more unique. As the payroll function has developed and changed so too have the systems and software which support the function. Also as technology has evolved, these systems have become more sophisticated. These days, if a company is still using an on-site server to house their payroll system, one which is not backed up to the cloud, then the question begs to why? Where in the past we have recognised that some roles and job functions need to change and so then we have allowed these changes to occur, one can only expect that so too should services grow and develop and be allowed to change. Off-site, cloud-based payroll services provide security in that your data is stored securely and back-up off site. The information which is on the payroll is now also accessible from anywhere on any device which enables flexibility and convenience for those who need to access this information. New Employee self services means that not only can managers and payroll people access the information, but so too can the employees themselves. Access and permissions as set according to a workflow of authorisations, in line with the company organogram which means that employees can only see which they have permission to see. And in allowing them access to their own information you are alleviating the burden of documentation and administrative functions from the payroll person and allowing independence to all employees. Payslips can be emailed and printed as and when required, SARS documentation, such as IRP5’s, is at the fingertips of the employee. 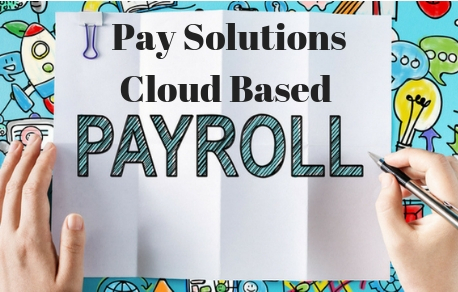 If this is the kind of convenience and simplicity you would like to experience in your business, Pay Solutions is the cloud-based payroll services provider for you.